The Kaweah River is one of the steepest river drainages in North America. Hailing from Sequoia National Park, the mostly free-flowing Kaweah tumbles and falls over 10,000 feet in 20 miles until it reaches Terminus Reservoir just west of the town of Three Rivers. Even though the Kaweah is far from “remote,” and Highway 198 parallels the run most of the way, the scenery is beautiful and the river offers some of the best whitewater in California. The Kaweah River pretty much starts off with a bang. If you are a private boater you will begin across from Gateway Restaurant under the East Fork Kaweah confluence bridge. There are a few Class IV+ rapids to navigate immediately. Commercial raft trips start a little less than a mile downstream at a private put-in on river left. The commercial put-in is mid-way through a Class III rapid, which often makes for an entertaining ride. Class IV rapids such as Willows, Lithium, Cyanotic, and Powerhouse are all in the first 2 miles. Excitement and adrenaline are forefront aspects of this run. Many rapids are a little like a maze; the river looks unnavigable until you realize there is a small chute, or a miniature line through bushes and trees, to get where you need to go. The Kaweah River is pretty open and if you have time to take a moment in between rapids and look upstream, views of the snow-capped Sierra Nevada mountains are spectacular. 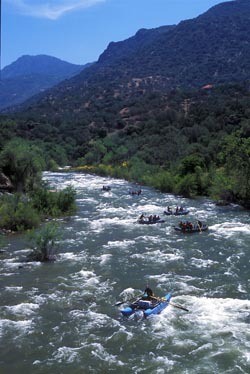 After Suicide Falls and The Chair, the Kaweah flows through the town of Three Rivers and mellows out for a short while. There are very few legal places to stop along the river since most of the land is privately own. You will sometimes even be confronted by barking guard dogs at the river’s edge. If paddlers want to stop for lunch, there are several restaurants along the river serving hamburgers or deli sandwiches. Make sure not to eat too much though because there are challenging rapids such as Slickies and Holiday downstream. As the Kaweah River reaches Terminus Reservoir, it flattens out and winds its way through low hanging trees. Many people nickname the last couple miles “the Jungle Cruise.” Take out at one of the public boat ramps in the reservoir. There are several other sections of the Kaweah that are probably better for private boating, since most of the land along the Three Rivers section is privately owned, making put-ins and take-out somewhat challenging.